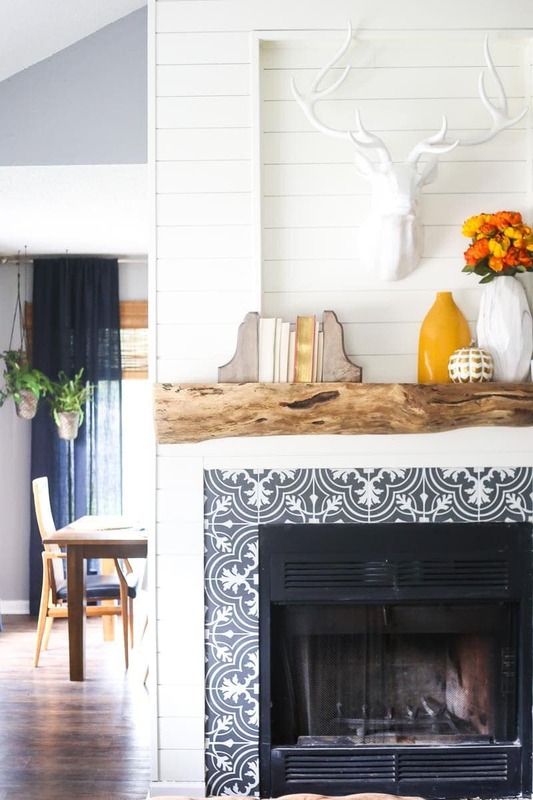 Our fireplace renovation is finally complete – we built a DIY mantel for our fireplace and the end resuls is stunning! 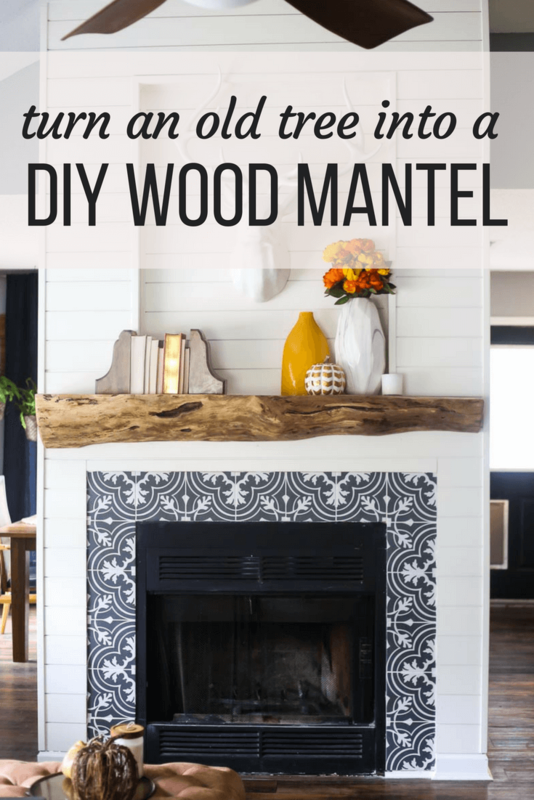 I love a good rustic wood mantel, and this DIY fireplace mantel is my new favorite thing in our house! This post is sponsored by Rust-Oleum, but all opinions are 100% mine. Thanks for supporting the brands that support Love & Renovations! 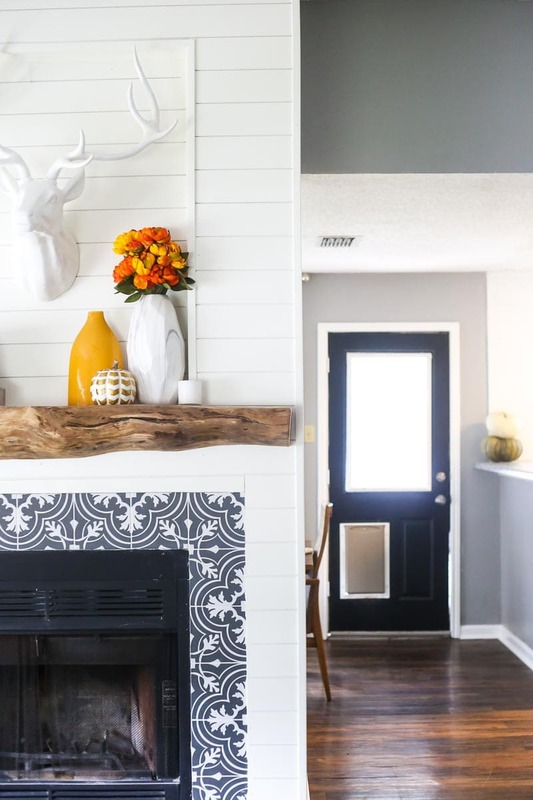 Last week, I (finally) shared the big reveal of our DIY fireplace makeover. Y’all, I can’t even tell you how much I love it and how happy it makes me. And, if you can believe it, it’s about to get even better. That’s right – we finished the mantel and it’s so good I want to cry a little. Because, you know, we just sold our house and I’m going to have to leave it behind soon. Thankfully, it’s a simple enough project that we can easily re-create it at the new house. Which I fully intend to do. This is basically the mantel of my dreams. 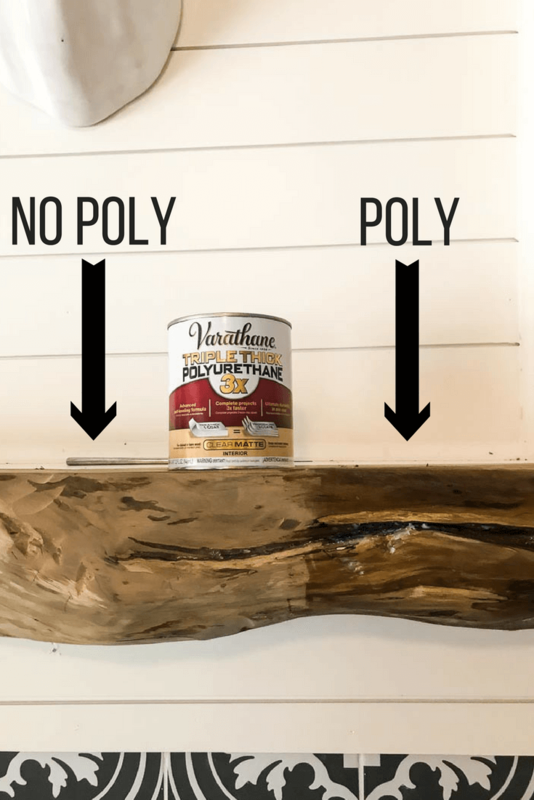 Corey and I have been talking about building a large, rustic DIY wood mantel for years and years, and I’m so glad we were able to make it a reality before we left this house. I don’t know if I could have handled leaving this house without letting this gorgeous fireplace see its full potential. Wanna know how we did it? If you want to try this for yourself, be sure to pin it to reference later! This project got started when Corey noticed that there were a few old oak trees being cut down outside of his office. He texted me and asked how annoyed I would be if he rented a U-Haul truck to bring some of it home. The answer was very. I was very annoyed. But, as usual, that didn’t stop him and he brought it home anyway. Typical. Of course, I shouldn’t complain – he had a vision for this old tree. He started by splitting one of the longer logs in half using a chainsaw. He then took off another side of it, so that we essentially had one-quarter of the original log. Next up is a lot of planing and sanding. Corey used an electric planer (he used this one) to get each side level, then sanded (and sanded and sanded) until it was all perfectly smooth. He also removed the bark from the outer portion of the mantel and sanded that smooth as well. I realize this is all sounding very quick and easy. It is not. There were hours upon hours of sanding, and every inch of the garage was coated in a thick layer of debris when all was said and done. But, trust me, it’s worth it. Once the mantel was completely smooth and cut down to the length we wanted it to be, it was time to prep it to hang. 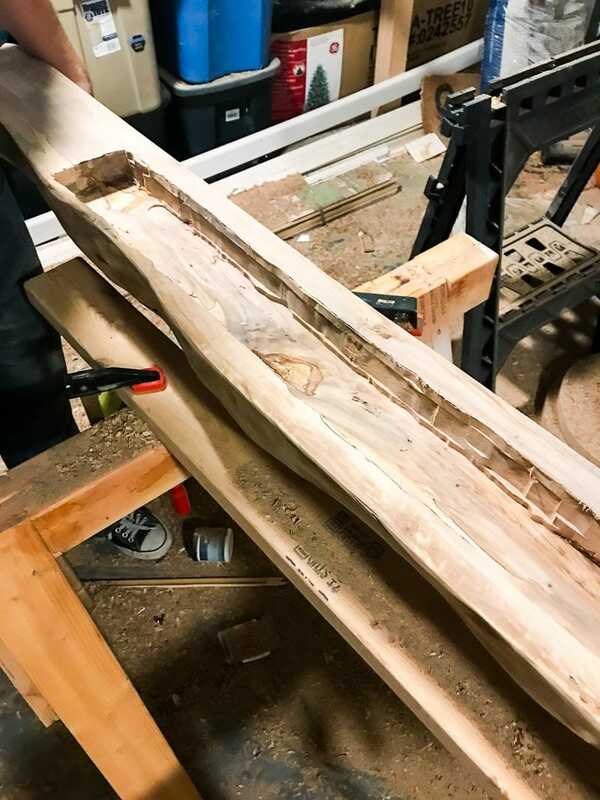 Corey cut out a groove in the back of the mantel that would perfectly fit a 2×4 board that the mantel would hang on. Then, we mounted the 2×4 to the mantel (be sure to drill directly into the studs – this thing is heavy!) using some heavy duty screws. 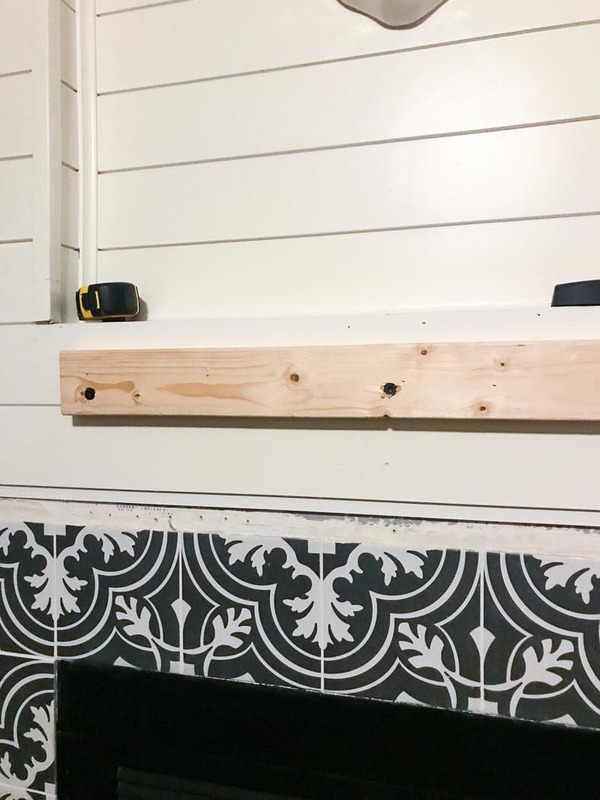 To hang it, all we had to do was lift the mantel up and fit it over the mounting board – then, we used some more heavy duty screws to drill the top of the mantel into the top of the 2×4. And with that, it was finally time to seal it. I used Rust-Oleum’s Varathane Triple Thick Polyurethane in Clear Matte for the finish. I just used a foam brush to apply one coat, then allowed it to dry fully before placing anything on the mantel. You can see how much of a difference it makes in the photo below! Oh, and see the pretty bookends on the mantel? Those are actually wood corbels that I antiqued – the original plan for this mantel was to include wood corbels underneath, but we decided that a clean look was going to look better (and we liked the live edge on the bottom rather than cutting it straight). So, I decided to use them as decor instead, and I’m kind of in love with them. We got them from Amazon, and they were originally just plain and unfinished. 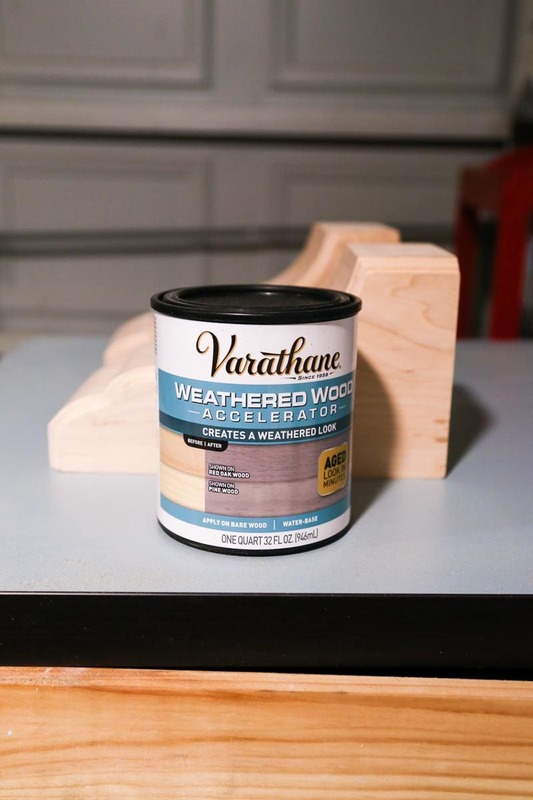 I used Rust-Oleum’s Varathane Weathered Wood Accelerator to make them look antique. Have you ever used this stuff? It’s my new favorite thing. 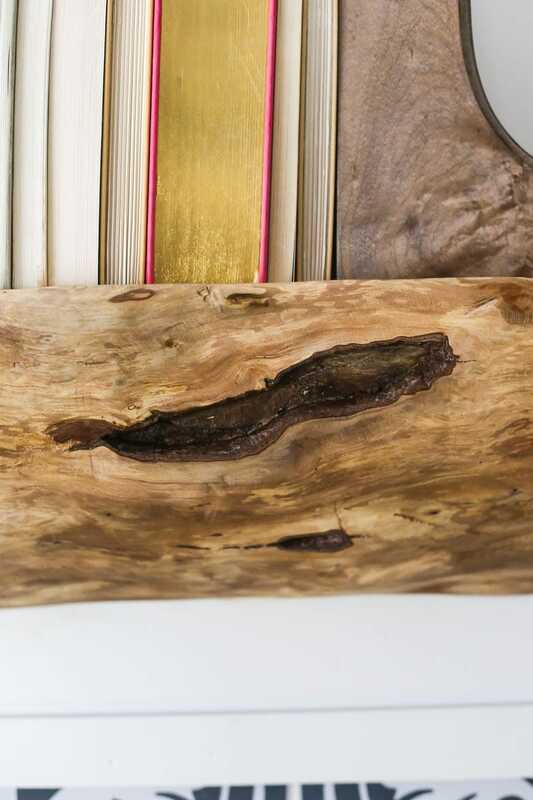 All you have to do is brush it on and let it sit for a couple of hours, and then you have perfectly aged and weathered wood that looks absolutely beautiful. Once it was all dry and looking perfectly rustic, I added the top coat to seal it. 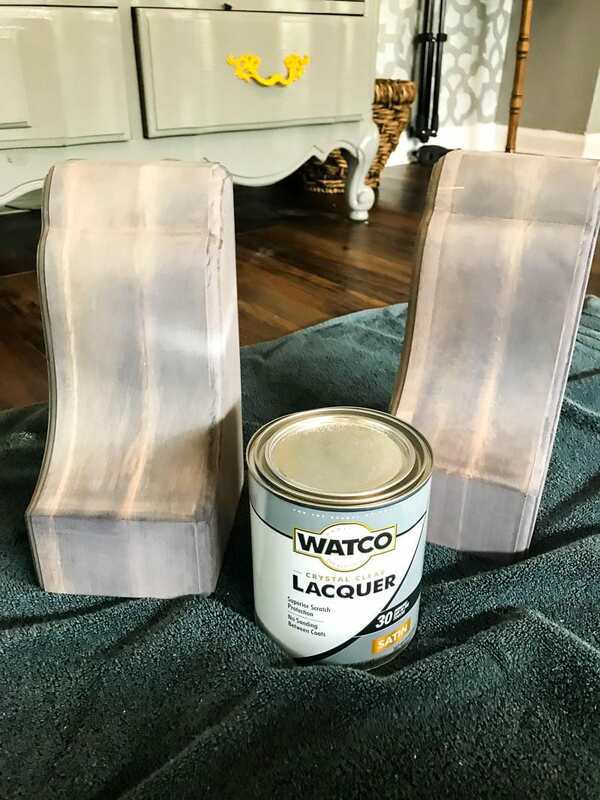 For this, I used Rust-Oleum’s Watco Lacquer in Satin – be sure to apply this outside because it’s smelly (do as I say, not as I do, my friends)! It gives the corbel a really thick and durable top coat that doesn’t interfere with the rustic beauty of the weathered wood at all. Even though we decided not to add the corbels to this mantel, we’ll have another fireplace makeover to tackle when we move into the new house – maybe they’ll work on that one? Fingers crossed! 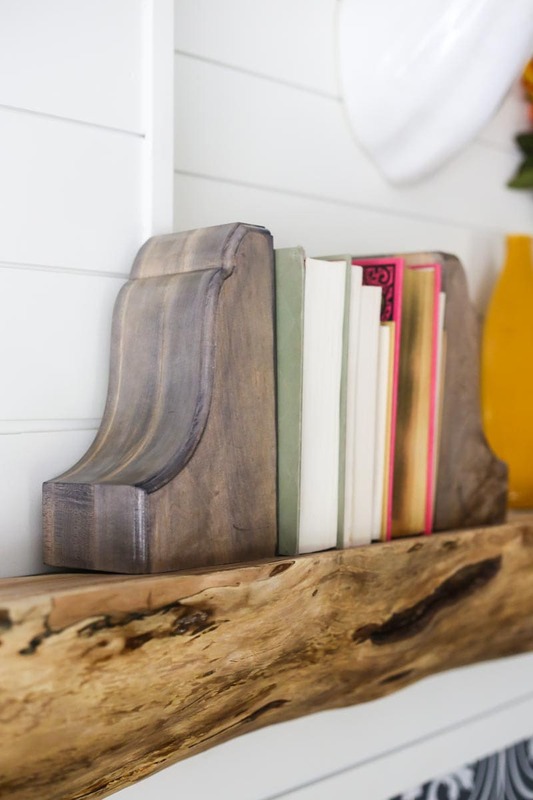 For now, I’m loving using them as bookends, and I love the look they add to the mantel. I know you guys have heard me talk about Rust-Oleum’s products about a zillion times by now, but can I just tell you again how much I love them? If you’ve ever done a project like this where you’re working with really unique materials that take forever to prep, then you’ll know how nerve-wracking it can be to apply any sort of finish to your project. If something goes wrong, it’s so exhausting to have to start over, and there’s always the worry that something will go so wrong that your project won’t be salvageable. It’s a little bit terrifying, but I’ve learned over the years that I don’t have to worry like that when I’m using Rust-Oleum. I know that I can trust any product of theirs to do a good job, and I never stress about having the finish look bad. Basically, they’re the best. As usual. And I love them dearly. I also love my fireplace. Like, a lot. And with that, I’ve officially shared the last major project we’ll be completing in this house. How crazy is that? We’re getting closer to the move (ahh! ), so soon I’ll be sharing a post with all of the final before and afters in this home. Final before and afters. That’s crazy to type. 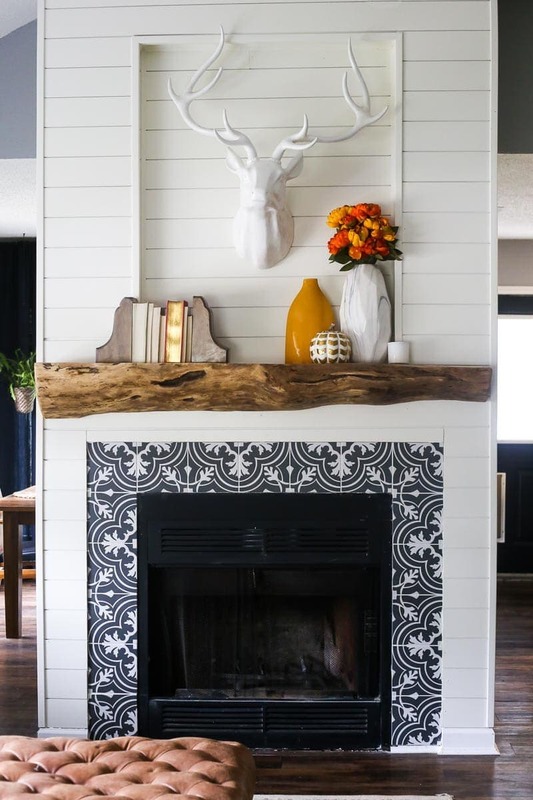 I’m so proud of how this fireplace turned out, and so grateful to Rust-Oleum for partnering with us on this! We’ve actually paired up with them for a few posts related to our mantel, so be on the lookout for some fun DIY mantel decor coming up in both November and December. UPDATE: See how we decorated our DIY mantel for fall, and how we decorated it for the Christmas season! Mmmm. Still swooning a bit. 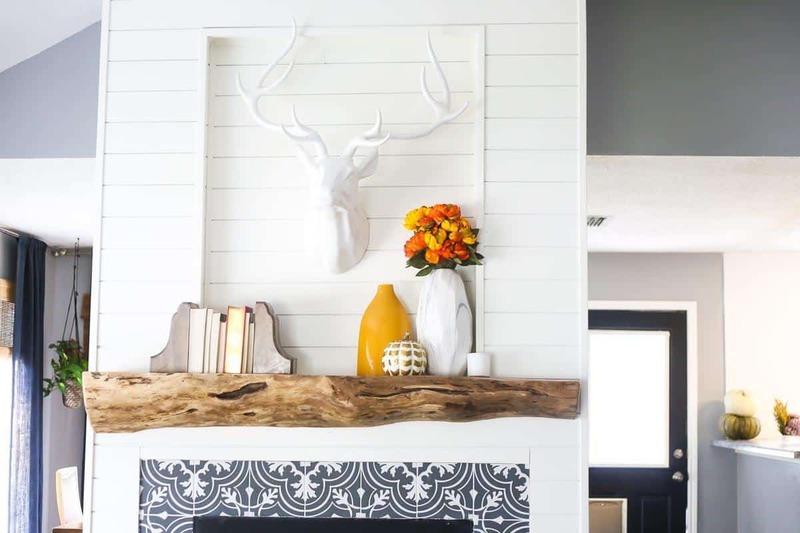 Have you ever built a DIY mantel? This is AWESOME! Just what we have been looking for to update our fireplace to use the cut down trees from our property!!! Glad it helps! Hope your project goes well! Are those black and white tiles or stenciled painting on the front? Love the whole thing! 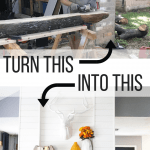 Looks great and I am redoing my fireplace ….great idea!!!! What is that around your fireplace? Tile? the black and white pattern…..?? Wow! This is freaking beautiful! 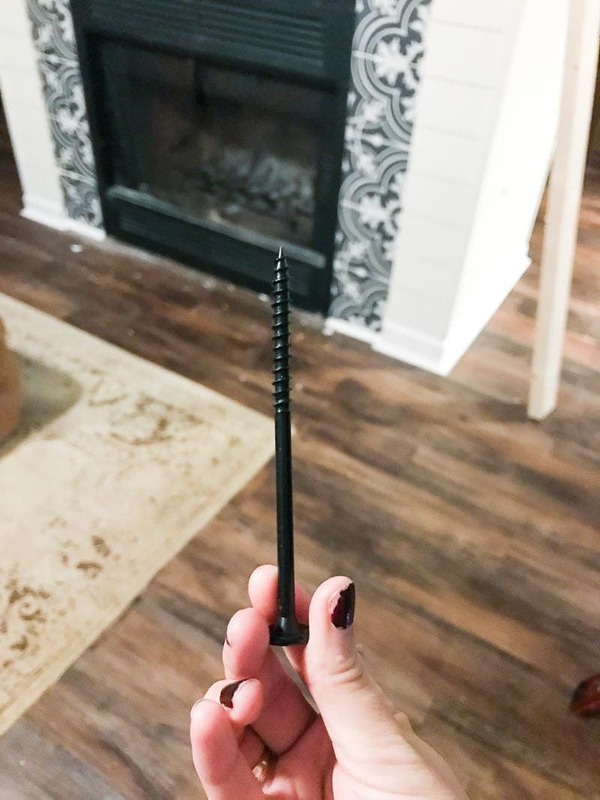 I can’t believe it is DIY! Thanks so much for sharing your tutorial with us at Merry Monday this week. This project is definitely going on the to-do list. 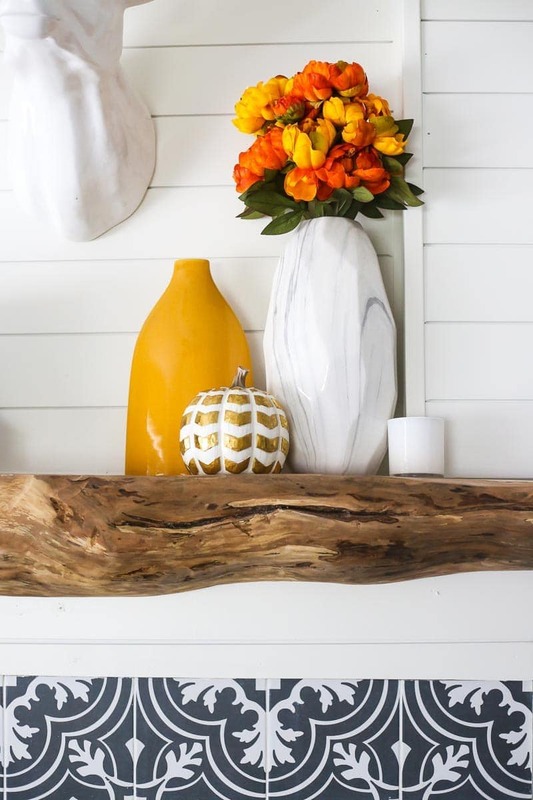 Love this mantel Amanda. I’m inspired to do something similar since I like scratching up new territory but right now, I don’t have the resources to start. For now, I’ll just bookmark this page! Keep up the good job. That’s a really cool mantel! 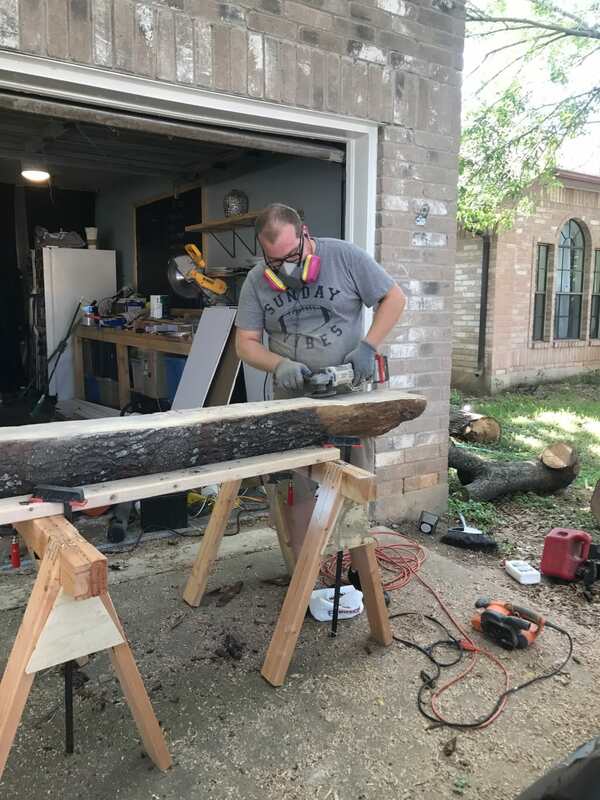 I have several pieces of trunk and some branches from an oak tree that fell at my parents’ house during Hurricane Harvey – I actually planted the tree myself about 25 years ago, so I wasn’t about to let it get hauled away! Now I’m trying to come up with some projects for it – I predict a lot of people will be getting DIY coasters from me for Christmas! Haha. What tool did you use to cut the ridge in the back? I’m wondering what tool to turn to for more precise cuts like that. Thanks, Jamie!! And wow – it’s sad the tree is gone but how cool to have the wood! He used a plunge router for the back of the mantel!